I am not always the first to know about big breaking news. A while back I made a conscious decision not to turn on my radio in my car, instead choose what I wanted to ingest through my ears. I have always been super sensitive to information, images, sounds and found that when I can make a choice on what I see, hear, witness, I lean into deeper health. There are benefits from this tuning out of mainstream media, but, there are also pitfalls of falling off course with the pulse of energy of the world around. Needless to say, it was just this morning that I learned about the devastating tragedy that took place Sunday pm in Las Vegas. As I stood in the ocean, waist deep, watching the spectacular sunrise up over the horizon, my friends shared the horrific national news. And, yet, the sun still rose and seduced us with its magnificent beauty. I now can help share the load of anger, grief, stress, sadness, and fear that so many are carrying. I feel compelled to speak louder about the philosophies of yoga: we are all one; one being; one body; one cosmic creation. When something like this happens, it impacts us all. We are all suffering. Yogis will state that is part of being human. How much we suffer varies from time to place to person. 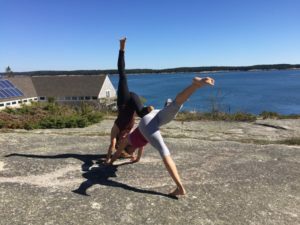 My hope as I continue to teach and share the messages of yoga is that even through the suffering, we all can fall back into the trust, support, and faith in knowing that we are all innately supported. We are this earth, this earth is us. We are never actually separate from or less than complete. The more we practice, meditate, and allow ourselves to feel trust, we can lean into a deep, wise, and unwavering sense of stability, support, and connection that is not biased, non-judgemental, and ever present. Call it what you wish, God, Mother Nature, the Universe, the Cosmos… there is something bigger than us all holding us all together in this giant web of life. Sometimes it takes pausing, listening, and reflecting to really understand and feel these ideas. I am grateful for all those yogis who ventured with me last weekend out to Hurricane Island and immersed themselves in the splendour of Mother Nature herself. 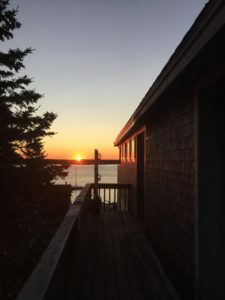 Please check out my blog to read reflections on our time together, as well as how I see the value of time in nature really helping to carve out a deeper spiritual connection to self, to life, to each other. But, the connection can also happen on our mats, in a breath, in looking into a loved ones’ eyes. A few deep breaths on your yoga mat can transition you into deeper sensation in mind, body, and spirit. If you have taken time away from your mat, listen to the calling now to show up. My hope and vision for all humanity is that we collectively become more and more conscious together. That we see each other as our brothers, our sisters, our earth. We are earth. We are one. In each Asana Junkies class I begin with a Peace Mantra, the last line is a call for peace. I want to share it with you all… Om shanti, shanti, shanti. Let there be peace in me. Let there be peace in my environment. Let there be peace in the forces that act on me. Last weekend was spent on the gorgeous and breathtaking Hurricane Island. The island is a special place, the views are jaw dropping, the air crisp, the food divine, and the company was loving. There was a moment when I was teaching from the Classroom and it hit me, aha, this is it! I stopped there in my tracks and just let silence fill the practice and space. 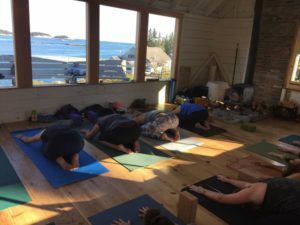 There I was, leading a group of conscious and connected beings through yoga, overlooking one of the most spectacular ocean views on the planet. A smile came across my face and I had a feeling of accomplishment. Yes! This is it! The experience in and of itself would have been enough of a feeling of delight and success. But, to settle the story deeper, about three years prior I had spent a lot of time visioning the future of Lila, my life, my family, and my teaching. What kept coming up for me in the vision is seeing Lila East End Yoga with an oceanfront view. The ocean has provided my own life with such deep connection, reflection, and energy, I wanted to be able to share this connection to others. As yoga is about integration and union, I couldn’t think of a better view to share these lessons than that of one that brought us back in touch with nature, in sync with the moment of tides, in pulse with the rise and the setting of the sun. At the time when the vision had come up, I was limited in thinking that that studio space would be in Portland. I dreamed of stumbling upon the right space on the overcrowded and overpriced waterfront in Portland. But, the later stopped, or so I thought, stopped the vision from moving forward. That same year David Vaughn tapped me on the shoulder and asked if I would be interested in leading a yoga retreat out on Hurricane Island. He had spent many summers there with high school studies studying biology, and he had a hunch it would be quite the setting for a retreat. We offered our first retreat last year, and it was quite a success. This year, we offered it again and the retreat doubled in size. Others were seeking solace in nature, next to the ocean, as well. This will be the 6th year I will be leading a retreat in Costa Rica, which again is another opportunity for me to share with other conscious beings the brilliance and abundance of nature in and around us. 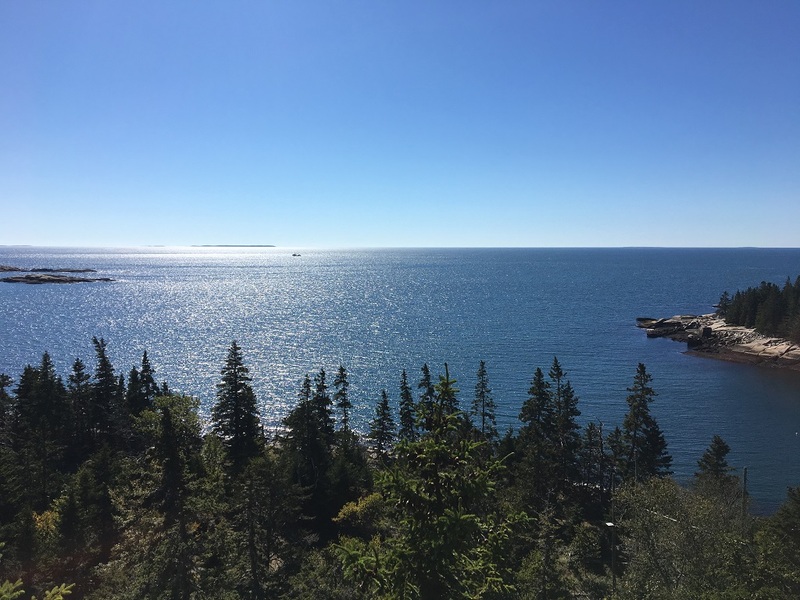 Between the gorgeous Maine view from the Hurricane Island Classroom and the open air yoga deck in Costa Rica, Lila East End Yoga has moved beyond the walls of Congress Street and out into the classroom of nature. My hope is that these experiences continue to grow and touch many of the yogis from the Portland area and beyond. Personally, on retreat, in nature, my own teaching comes alive. I feel connected to the lessons and teachings in such a real, felt sense way. The lessons I teach, the readings I share, resonate with a deeper understanding and meaning. I am ever so grateful for all of those who have joined me on these adventures and for those eager to join me in the future. Let’s keep expanding the walls of Lila to encompass nature’s offerings.